Youth Gathering Informational Meeting Coming Soon!! Saturday, May 6th in two locations!! There will also be an opportunity to join via a conference call or Google Hangout. Please click on the registration below to answer a few questions regarding the gathering and let us know which meeting you will attend. Thank you!! The tAble (formerly the Definitely-abled Youth Leadership Event or DAYLE) is a pre-event to the Gathering that blesses and empowers young people who live with a wide range of physical, cognitive and emotional disabilities so that they might grow as faithful, wise and courageous witnesses. The event also gives participants the opportunity to acclimate and orient themselves to Houston and the venues in which the Gathering are being held. Please let Lynn Egesdal or Kim and Tracy Gayer know if you have youth that would like to attend this event. The Multicultural Youth Leadership Event is a pre-event to the Gathering. It empowers young people of color and those whose primary language is other than English to claim their story as a part of God's story. Please let Lynn Egesdal or Kim and Tracy Gayer know if you have youth that would like to attend this event. For a free copy, download below!! This handbook contains tips and tricks that all leaders will find beneficial. About any question you can think of is addressed in this book, yes, even planning a budget and fundraising ideas. 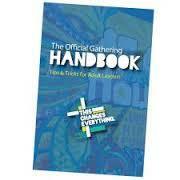 It's a great little handbook to read through, even if you're still only considering going to the gathering. We do hope you will make plans to join us! !